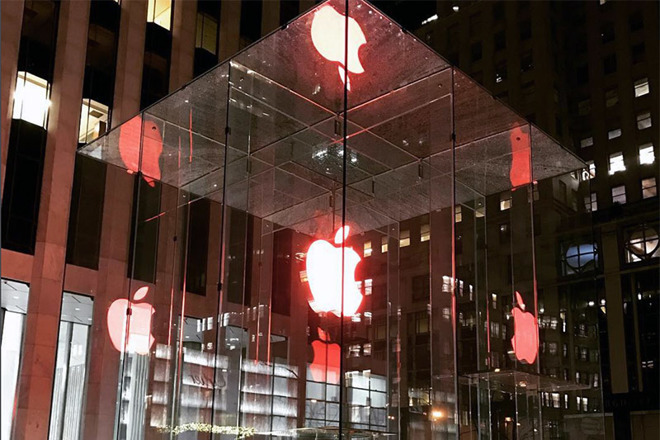 Apple on Thursday tinted red the iconic backlit logos installed outside brick-and-mortar stores around the world, continuing a long-standing tradition in support of World AIDS Day, which falls on Dec. 1. As in years past, more than 400 Apple outlets from New York to China are now fronted with red signage, while employees inside wear red shirts instead of the standard blue uniform. The changes commemorate Apple's partnership with the Project(RED) charity, an initiative cofounded by U2's Bono to raise awareness and funds to stop the spread of HIV/AIDS in Africa. Apple, along with a number of other major product makers and retailers, creates special Product(RED) branded items and donates a portion of the purchase price to The Global Fund. Apple first collaborated with the charity in 2006, later mandating the annual store logo color change in 2012. This year Apple launched a few new accessories and special edition devices as part of the effort. Headlining the 2016 Product(RED) lineup are red versions of the Beats Solo3 Wireless headphones and Pill+ Bluetooth speaker. Apple is also marketing a red iPhone 7 Smart Battery Case and red leather-backed iPhone SE Case. In addition to hardware, the company is donating $1 —up to a cap of $1 million —for every Apple Pay transaction made at an Apple store, on Apple.com, or through the Apple Store app from now through Dec. 6. Bank of America is making an identical pledge for every Apple Pay transaction involving its various credit cards. For its digital stores, Apple partnered with app makers to deliver (RED) branded in-app purchases for 20 popular games, while iTunes is accepting direct donations. Music act The Killers is also donating proceeds of its holiday album "Don't Waste Your Wishes" and their cover of "I'll Be Home for Christmas" to the (RED) initiative. Apple CEO Tim Cook in an interview this week defended the company's Product (RED) promotions against assertions that the charitable partnership was born out of pure self-interest. "We'll always help the most people through our products, because they empower people to do great things themselves," Cook said. "But this (RED) partnership allows us to touch a group of people we normally wouldn't. Sub-Saharan Africa is not a big marketplace for us. This is about trying to lift people up."